Hi everyone! 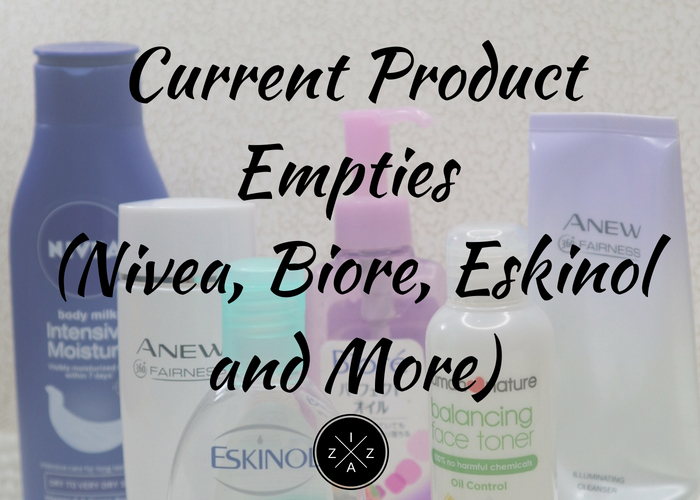 Today I will be sharing another Current Product Empties. You can click here to read the last product empty post I did which was last May 2017. It’s been a year since I last share the skincare and makeup products that I have finished. Although for this batch I didn’t have any makeup item. Being able to finish a skincare or makeup product is such a huge accomplishment. It means something really works well and just became part of my daily routine. I will also mention whether I plan to repurchase a certain item or not. I have always loved Nivea’s Intensive Moisture Body Milk. For me it’s one of the best lotion available in the market. It’s cheap, works really well and does not feel greasy after use. I highly recommend this effective lotion when you want moisture back to your skin. The consistency of this lotion is somewhat watery so it can be easily absorbed by the skin. The smell is amazing too although not as scented as the Human Heart Nature 100% Natural Healthy Lotion in Berry Bliss. I actually got my Nivea Intensive Moisture Body Milk during a Big Nivea Sale 50% Off last March and the one I finished was my first bottle. I am excited to use my second bottle! Will I repurchase? Definitely Y-E-S!!! I emptied my second Avon Anew 360° Illuminating Cleanser! Out of everything on the Anew set this is the one that gave me result in as fast as 3 days. I find myself looking forward to use it in the morning and night. After every wash my skin feels soft, clean and clear. The foam glides easily on the face creating a very rich lather. I also love the rich smell of this product. It is really foamy and a little comes a long way. The only problem I see is that this product is not always available. I had to purchase a different face cleanser because I was told by the nearest Avon dealer at home that the product was sold out. Will I repurchase? I plan to repurchase this cleanser after I emptied the face cleanser I am currently using. This is also the second Avon Anew 360° Illuminating Toner that I emptied. I really like this toner because it is different from the toners I’m using. I included the first bottle in my last empties post and I mentioned how it feels more like a second cleanser to me. As always I feel like my face is squeaky clean, feels refreshed, hydrated and tightened. It deeply cleans my face without drying. It magically removes the dirt and excess oil that the cleanser missed and still retains the moisture in my skin. Will I repurchase? A big YES! I actually have another bottle waiting for me. Biore Makeup Remover Perfect Cleansing Oil is part of my BeautyMNL Haul. This is a little expensive than micellar cleansing waters out in the market today but I promise, you will be amazed by how it work. The Biore Makeup Remover Perfect Cleansing Oil is easy to use. I enjoy putting it on dry face first and then rinsing my face with water followed by a face wash. True to its claim this one doesn’t feel and look greasy at all. The smell is also really good, it smells like grapes. A pump or two is enough to remove all of my makeup especially the waterproof mascara. I even brought this with me when I traveled to Seoul last month and it performed well. Really worth every penny! Will I repurchase? Yes! I really like how this product remove my makeup effortlessly. Have you watched Alex Gonzaga’s skincare routine video? I watched the video and was amazed by Alex’s rant on the Eskinol Pimple Fighting Facial Deep Cleanser. It’s true what she said in the video, a normal cleanser is not enough to clean one’s face thoroughly. After cleansing her face with a normal face cleanser, she used Eskinol and still got some dirt left. After watching the skincare routine video, I purchased this Eskinol Pimple Fighting Facial Deep Cleanser immediately. I knew I needed to use something in between cleanser and toner. I really enjoyed using the product because it leaves a cooling effect on my skin. Plus, it works really well. Eskinol became more of a prerequisite to me before applying anything else on my skin after cleansing. Sometimes when I’m in a hurry (in the morning) or lazy (in the evening) I just stopped my skincare routine with this and either head out or sleep already. Will I repurchase? Without a doubt, yes and a bigger bottle next! This is one of Human Heart Nature’s most hyped skincare product. And it definitely deserves all the hype. Finishing a full-size bottle of this Human Heart Nature Balancing Toner is such an easy thing to do because it's so good. The fact that it is alcohol free, 100% all natural and made for oily skin is what makes it stand out the most from the toners I tried and tested. It shrinks enlarged pores, evens out skin tone and minimize blackheads. The smell of this product is so good too. You can buy one here. Will I repurchase? Another yes from me!